Jason recaps the events from Roll For Combat, Episode 060: Undead on Arrival. I have to confess, the editing of this week’s episode threw me a little. I came in prepared to talk a lot about Amanda Hamon Kunz’s visit to the show, but I kinda feel like I want to push most of that to next week because it feels incomplete until you, the listener, have had the full Wynetta Trux Experience. So with no disrespect intended toward Amanda, I’m going to mostly set her aside for next week, other than to say it was a lot of fun having her on the show. Instead, let’s start with Steve’s GM note about changing PCs, with a particular eye toward Tuttle. It is true that Tuttle has changed from the way I drew him up in my head, but it’s kind of funny how unintentional it was. (At least at first; at this point, I’ve started intentionally leaning into it.) To recycle that old joke about fights and hockey games, I went to a min-max and a roleplay broke out. Tuttle started in my head as a very bookish academic who kind of turned his nose up at getting his paws dirty. If there was any more reputable gig that could fund his scientific ambitions, he’d rather be doing that, but here we are. And it’s only been recently that I’ve explicitly thought “Tuttle’s adventures are going to change him – he’s going to see that being a sheltered academic is limiting and embrace the chaos of field work”. To be honest, most of his changes were rooted in pragmatism: either solving the last problem we faced (especially if it revealed something that would be an ongoing issue moving forward) or anticipating a problem that was coming up. But still, it is true that walking through those progressions DID change how I perceived him and his willingness to “get weird for science”. And I think what makes it work is that there are pieces of his core that are preserved – it’s a fusion of the old concept and the new concept. If I threw EVERYTHING about Tuttle out the window, then I’d just be min-maxing and making the character portrayal follow the stats. But I like to think I’ve preserved enough of the old Tuttle to keep on the right side of the Roleplay Gods. He’s still content to let CHDRR be the muscle of his personal operation, so CHDRR still gets all the combat feats and if Tuttle takes combat skills at all, they’re usually defensive. He’s still got the same ethical center, which usually manifests in giving Hirogi’s ethical lapses the stink-eye. While he’s embraced the necessity of roughing it, he still complains about it quite a bit – at any given moment, he’d still rather be nursing a coffee, tapping away on a keyboard, with indoor plumbing and air conditioning at his disposal. Now, on to Eox. This week, we mostly experience Eox on a theoretical level, and really only get into the meat of it in the last 10 minutes or so. But we still learned some interesting stuff. First, the physical environment. Radioactive and/or poisonous atmosphere. Nights last 15 Pact World days. Huge flesh-rendering plants that make the place stink of death. Yep. It’s Mordor. It’s also kind of interesting to see the degree to which the living are tolerated rather than accepted. I’d been viewing this through my Pathfinder lens – I mistrust undead because undead were pretty universally bad guys there. It never really occurred to me to think about what the undead thought of the living and how they might be treated. So that was an eye-opener. And that’s even the “good” undead. We haven’t even gotten to the Corpse Fleet yet. Speaking of the Corpse Fleet, as we discussed a little bit in the podcast, it doesn’t sound like Eox takes the Corpse Fleet THAT seriously, or maybe they don’t care as long as the Corpse Fleet is only going after living targets. One office in the worst part of town, staffed by one person, and (it seems) all she does is file reports – largely logging crank calls if Sean is the measuring stick – with the government that largely get ignored? There was something about the bureaucratic indifference of it that that reminded me of the beginning of Hitchhiker’s Guide To The Galaxy – I was waiting for Trux’s office to be an out-of-order restroom with a “Beware of the Leopard” sign on the door. There’s also something that came up while listening to the show I wanted to discuss which… I’m going to ask your indulgence here. It’s a weird little rabbit hole that even though I went through the books to re-read the lore and “proved” it couldn’t be true, it left an interesting residue. Interesting enough I wanted to throw it out there for grins. What if the pre-Gap history was somehow wrong and Eox was Golarion? What set me off was Steve’s description of the crater. Something in my brain latched onto that and said: “Oh, that’s just like the Worldwound”. And from there it was off to the races. Now before you all send me 30 copies of the History Channel Alien Guy image with the caption I’M NOT SAYING IT WAS GOLARION, BUT IT WAS GOLARION… I know it’s wrong. Eox is in the wrong orbit, so there would have to be some Wrath of Khan Ceti Alpha 5 shenanigans going on. And the original inhabitants of Eox are identified as the elebrians, a race related to but distinct from humans. And some of the pre-Gap history references the existence of Eox. And the gods themselves say Golarion is out there somewhere, safe and sound, waiting to be found. But it was a neat what-if to explore: what if undeadishness had won the long game in the campaign setting we’ve been calling home for the past decade? What if all those Pathfinder adventures saved the world, only to let it advance to the point where it could destroy itself so completely they had to turn undead to save themselves. Kinda sobering, isn’t it? I realize this is “what if our planet is an electron in an atom in a larger universe?” level crazy-talk, but it was fun to think about. Or maybe I was just sleep deprived and missing my first cup of coffee. You tell me. Speaking of indulgence, I’d like to close with a few words about the passing of Stan Lee. Yeah, I know his bailiwick was superheroes, not roleplaying games, but I feel like there’s a fair amount of overlap in the various fan communities. I don’t have any personal story of meeting him, and I don’t feel a compulsive need to list my 34 favorite Marvel characters in order of preference. (ABRIDGED: 1. Spider-Man. 2. Everyone else.) And I also recognize his contribution to pop culture was somewhat a product of his own hype, and he sometimes stepped on other creators to claim the lion’s share of the credit for himself, but we can unpack that some other day. 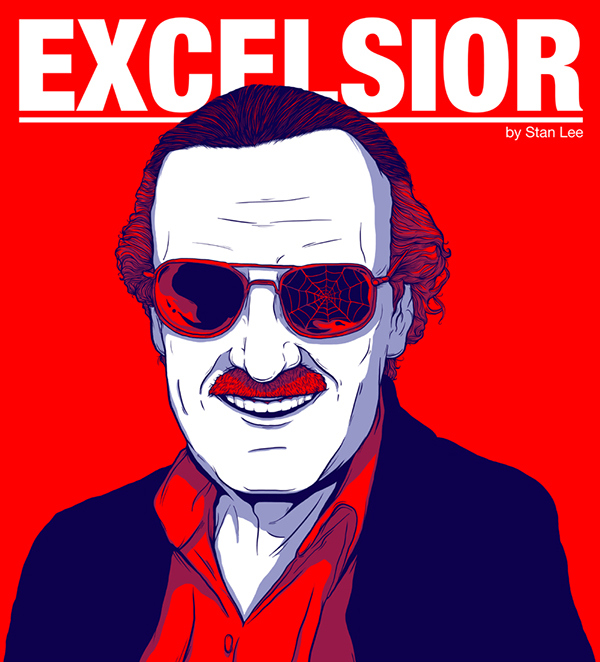 I think what I really loved about Stan Lee is how he used his public persona – even after he was out of the day-to-day at Marvel and had no more direct skin in the game – to respect and affirm people like us: people who wanted to exercise our imaginations in ways that might seem unconventional, people who didn’t see anything wrong with indulging in a little escapism because it was FUN. Hell, the man made a career out of it. Here’s a guy who was a success in the entertainment world, using his platform to tell us that stories about a kid bitten by a radioactive spider (or, at the risk of indulging hubris, making up your own stories about a science rat with a robot buddy) are just as worthy of your time and attention as More Serious Pursuits. And his cameos, which started as a bit of a gimmick, evolved into a bit of a low-key covenant with the fans – “if you keep showing up, so will I”. It was almost like having that relative out on the edges of your family tree who you don’t see all that often, but sometimes got you in ways your closer family didn’t. Good old Uncle Stan. Gonna miss him. NextNext Talking Combat 061: My Undead Has A First Name – It’s R.U.S.T.Y.